There are many ways to store and display your craft supplies that are creative, clever and won’t break the budget. 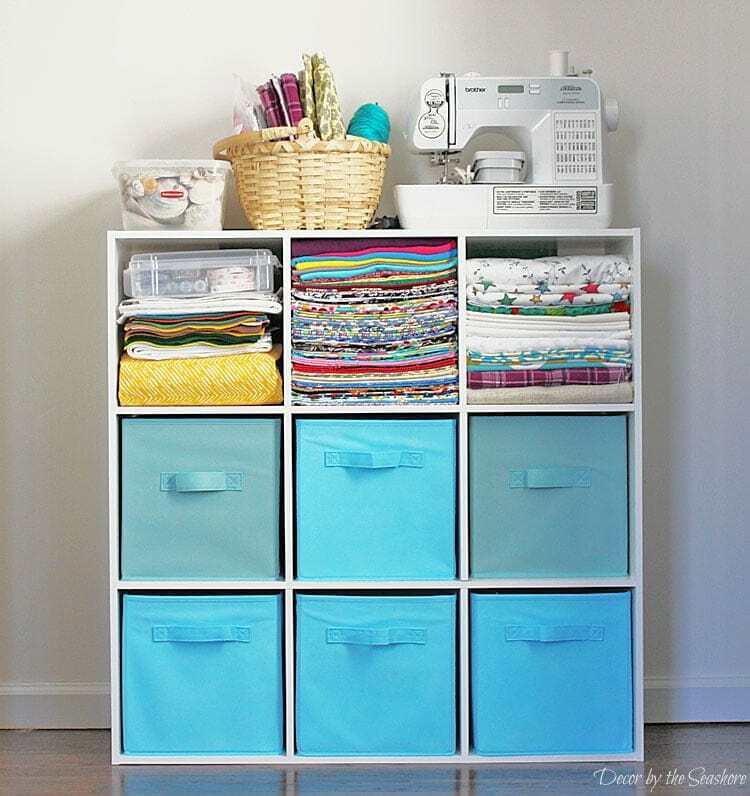 Whether your craft room is small or large, make the most of your organization with these simple yet functional ideas. Storing essential craft supplies can be a challenge. I don’t know of any crafter that doesn’t want a beautiful, functional space. There are a lot of solutions out there on Pinterest, but it can be overwhelming to have so many options in front of you at one time. Luckily for you, I’ve decided to pull together just 15 Clever and Creative Craft Organization Ideas that are easy to implement, stylish, and downright clever. I hope one or two will inspire you to tackle storing your supplies and help you smile when you enter your space to get creative. Cabinets and bookshelves are a tried and true way to organize items in any space, but often, that means you end up with unused space. When it comes to our craft supplies and tools, real estate comes at a premium. To make sure you’re maximizing the space you have (no matter how large or small) use drawers instead. Rolling carts are very trendy right now, (thanks Ikea!) but they are also functional and easy to store away in a corner if you need them out of the way. Top them with small glass vases and decorative boxes and store smaller items or scrap ribbons. This is a beautiful and functional way to store the bits and bobs you have left over from any project. I don’t know any crafter or DIYer that doesn’t have unfinished projects. But what do you do with all the unfinished projects you have piling up? I love this idea from Shrimp Salad Circus. Use a rolling cart and inexpensive plastic bins to store all of the pieces and tools. If you need to tidy up, it’s as simple as clasping the lid and pushing the cart out of sight. Kitschy decor is a dime a dozen at garage and estate sales, but you don’t have to use them in the way they were intended. Instead, use fabric or a can of spray paint to update them, and then use that vintage wall planter as ribbon, paint or other craft supply storage. We’ve all inherited hand me down furniture (think college days). It doesn’t always suit your style, but you can give it a quick and inexpensive makeover with paint and new hardware. Remove doors, add baskets and bins and you’ve got gorgeous storage to help your organize your craft space. We want to store our craft “stuff” but what if we used it to store other supplies instead? Jennifer used her spare embroidery hoops to create hanging storage for her space. Colorful and useful! Use pegboards and hooks to create a “creative wall” like this one. I love how wrapping paper is stored up and off the floor. All the ribbon and tools are up off of the crafting surface and it looks pulled together and colorful too. Especially when dealing with a small craft room space, you’re going to want to utilize the walls to create as much storage as possible. If your kids like to craft with you, you know how challenging that can be. 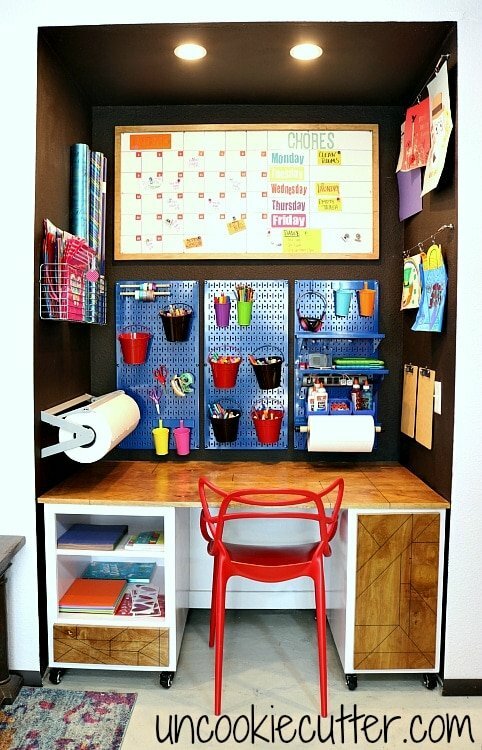 Instead, use a nook or closet space and give them their own crafting area within your space. Pegboards are a wonderful solution to store pens, markers, crayons and other tools within easy reach. Think outside the drawer. I know that I’ve seen old drawers on the curb more than once, but I never considered giving them a quick paint job and hanging them up to store bottles of acrylic paint, adhesives or glitter. Office Makeover – Paint Drawers via Girl, Just DIY! Another basic shelving unit gets a cohesive look with pretty blue mason jars, baskets, and bins for craft supplies. The blue jars add a touch of color while holding snippets of ribbon, while chalkboard labels add accessibility and organization to the baskets. 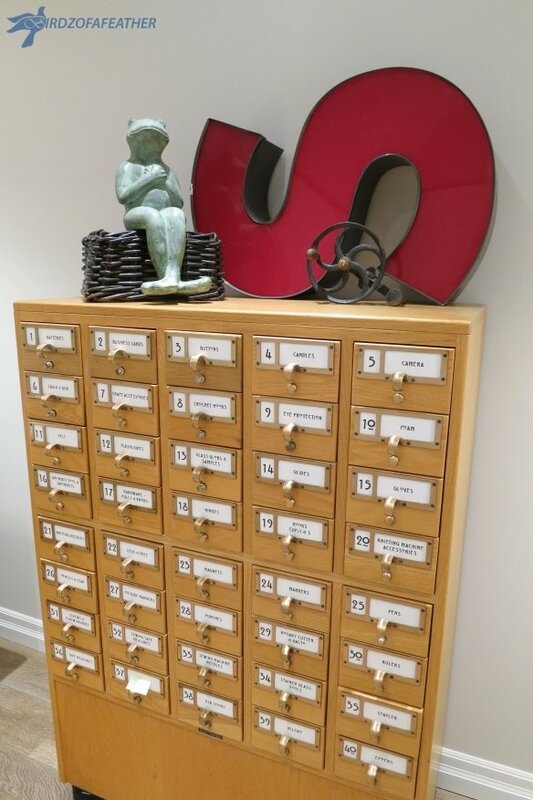 Who doesn’t want to own a card catalog? I love the idea of using one to store small items in just about any room, but it makes so much sense for craft storage. It would provide a place to store sewing notions, pocket scrapbooking cards or your collection of pens and brushes. Plastic bins with labels might seem like a basic tip, but there’s a reason it’s mentioned often. It works! You can find inexpensive plastic bins with lids at any big box store these days. Opt for ones with colored lids and add a splash to your space. Don’t hide your supplies. Instead, use them to decorate your space. I love the idea of displaying your pin cushion out in the open (though up high if you have small hands in the house) or storing scissors in an otherwise unused vase. It’s colorful and functional. Craft storage doesn’t have to cost a lot of money. Instead, buy affordable shelving and give them an upgrade by adding fabric or wallpaper to the backing. Then just add neutral bins and boxes and store your craft and sewing machines. Cubbies are another common find on Pinterest, but they really are a practical solution for a craft space. Add cohesive or coordinating bins, and baskets for a uniform look. Even the smallest space would benefit from a shelving unit like this. Craft room storage doesn’t have to be expensive or complicated. Use what you have, shop estate sales, and add color to what you find and soon you’ll have the most organized space in your home! What’s your best tip for storing your craft supplies? Let me know in the comments!